The Nepali word for a small hotel is bhatti. These have existed for centuries in the hills. A bhatti is usually a wooden or maybe even a bamboo structure close to the trail, with the large house of the owners some distance away. It usually has a simple mud stove with a pot of milk and another pot of hot water to make tea. Most bhattis have a jug or two of chhang or rakshi in the back room to provide a bit of alcoholic diversion for the village elders and the few overnight guests who happen along. Where trekking has not developed, these reasonably primitive establishments are still the only hotel facilities available. With the growth of the trekking industry, facilities have improved and there is now an extensive system of lodges serving major routes. Most hotels in the hills are family-run affairs that started in the living room and grew as more and more trekkers appeared. Many lodges now have private rooms for guests, but at some the family that operates the inn eats and sleeps in the same building, and often the same room, that it offers to guests. 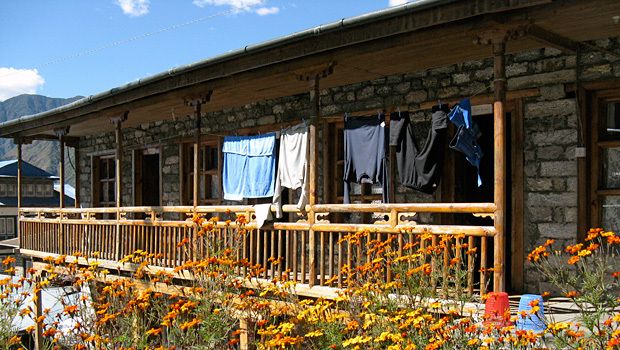 Since the 1970s, the money from trekking lodges has become the major source of income in many hill villages. Lodges have become larger and grander. There has been 25 years of continual hotel construction on the Everest and Annapurna treks, and it’s a rare visit to the villages of Ghandruk and Namche Bazaar where you are not subjected to the sounds of hammering by rock masons and carpenters. Features such as pavement cafes, sun rooms, private rooms, indoor Western-style toilets and electric lights abound. Hotels compete for the attention of your stomach with offerings of cake, pie, pizza, steaks, tacos, enchiladas and spaghetti bolognaise. There are some excellent lodges in the hills, but there are many more second-rate establishments. The hot shower may turn out to be simply a bucket of lukewarm water and the toilet may be a latrine behind the hotel. The private room can be a wooden cell with no furniture except a bed, mattress and several peepholes into the adjoining rooms. The primary incentive for operating a hotel in the hills is to turn locally produced food, labour and firewood into cash. The hills are increasingly becoming a cash-oriented society, and operating a hotel allows people to earn cash while remaining at home and tending to the house, the children, livestock and crops. The prices at most hotels in the hills are artificially cheap for this reason. The Annapurna Conservation Area Project (ACAP) helped encourage lodge owners to standardise rates for food and accommodation, with the result that most hotels in a particular village charge the same price. Committees of lodge owners in the Annapurna, Langtang and Everest regions have established minimum rates. The cost of accommodation is very low and hotel-keepers expect you to eat in their establishments so they can earn a bit more money. You will probably be quoted an exorbitant price for a room if you don’t eat in the same lodge in which you sleep. Often the husband of the house is away trading or working as a porter or trekking guide. Usually the wife manages things, but sometimes hotels are left in the care of children – some pretty weird meals and service can result when a six- or eight-year-old tries to deal with customers. Unfortunately most lodge owners are too busy being short-order cooks to allow them much opportunity to talk to trekkers. Your cultural interaction on a trek will more likely be with European, Australian and American trekkers as well as trekkers from Israel and Japan. Staying in a Lodge When you arrive at a lodge for the night, reach an agreement with the innkeeper on the cost for sleeping. Check out facilities and read the menu to decide if the food offered is what you want. Choose your hotel based on the quality of both food and lodging. A typical room charge in Namche Bazaar is Rs 100 if you eat in the hotel and Rs 600 if you eat elsewhere. If you have booked a private room, you will usually receive a padlock and key. If you are staying in a dormitory, the best way to protect your booking is by unrolling your sleeping bag on the bed you have selected. Experienced trekkers do this as soon as they arrive, even before having a cup of tea. Many hotels have menus that show all their prices, including the charges for sleeping. There is rarely any bargaining and the menu really does represent a fixed, and usually fair, price. Check the prices before you order to avoid later hassles. Strangely, the places most prone to bargaining are the fancy hotels – the US$ 20 per night variety – which have lost a lot of business to smaller and cheaper facilities. Some trekkers have reported negotiating lower prices in hotels during the monsoon season and the middle of winter. During times of heavy demand, such as during a flight back-up at Lukla or when snow on Thorung La has caused a backlog of trekkers at Manang or Muktinath, accommodation becomes expensive and difficult to find. Most times, however, basic accommodation can cost Rs 50 to 200 and will be found without too much trouble. Fewer lodges at high elevations have private rooms. Instead, their dormitories have several huge beds that sleep 10 or 20 people, often in two tiers. High altitude can make people uncomfortable, sleepless, crabby and strange. In hotels there can be a lot of thrashing about and opening and closing of doors throughout the night. Earplugs are a good investment. If you value sleep and privacy, consider the advantages of bringing your own tent. Since a hotel also doubles as a home, whether it has a sign that says Hotel or not. you may have a difficult time sleeping until the entire household has retired. Trekkers who walk and exert themselves all day require more sleep than they normally would at home, often as much as 10 or 11 hours each night. Village people who are not exerting themselves during the day can get by with six to eight hours. This presents an immediate conflict in sleep requirements and lifestyle. The conflict escalates when the inevitable booze and card party erupts in the next room or, worse yet, in your bedroom. Another universal deterrent to sleep is the ubiquitous Radio Nepal, which does not stop broadcasting until 11 PM. During the trekking season there is a daily rush for space in hotels. In October it is common to find trekkers sleeping on the floor – or on tables – in lodge dining rooms because all the rooms are booked up. It’s quite mad to spend your trek in competition with other trekkers racing to get a good space or a private room at the best hotel in the next village. In the Everest region, in particular, this can be dangerous because of the elevation gain and the chance of altitude sickness. If you find yourself travelling on the same schedule as a gaggle of other trekkers, relax for half a day and try to operate a half-day behind them. Hotels at traditional night stops can be empty at lunchtime and the hotels where most trekkers eat lunch are often deserted in the evening. Previous post: What kind of Trekking in Nepal?